After previously supplying United with kits for the last 3 seasons, TFG Sports extended the deal into the 2003/04 season. The new white Away kit has a similar look to the previous seasons green version, with two coloured stripes across the chest, this time black and tangerine. The Club badge and manufacturers logo were positioned in the centre of the chest, with the badge sitting on top of the two horizontal lines. The only other noticeable detail on the top was the black piece at the front of the V neck collar. Chairman Eddie Thompson's chain of convenience stores stepped in as shirt sponsors when a deal with Emirate Airlines collapsed at an advanced stage, and Morning Noon & Night's name was emblazoned on the front of the Away kit in simple black text. 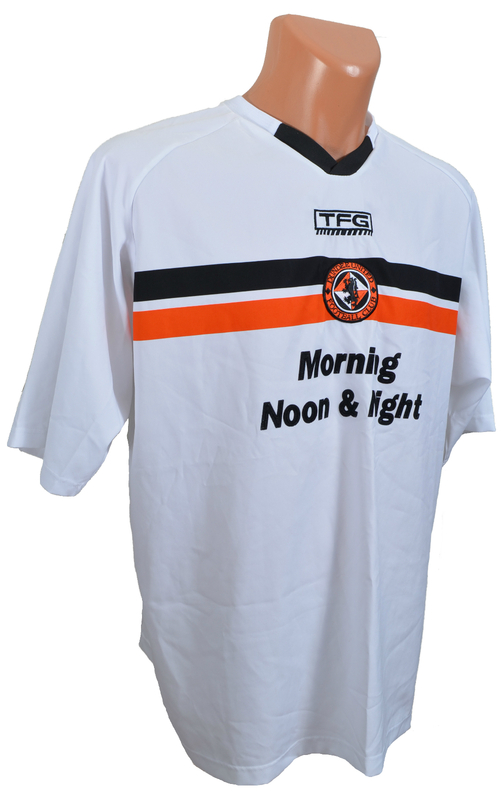 The Away shirt was unveiled along with white shorts and tangerine socks, however the two kits were interchangeable, with the home kits tangerine shorts sometimes worn along with the white shirt. With Ian McCall's rebuilt squad, the Away kit was first seen in a 0-3 defeat at Tynecastle, and was worn in the usual matches against Hearts, Motherwell & Aberdeen. It was also used on occassion against Livingston, with Jim McIntyre scoring a late winner in a 3-2 win at Almondvale for a vital win that helped the side finish in the top six of the SPL for the first time since its introduction in 1998, United's best season in six years.